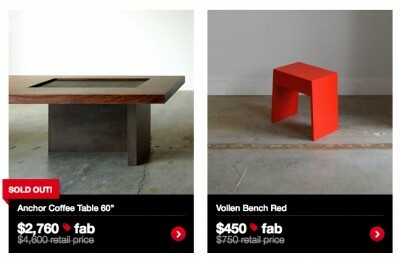 Fab.com is a daily deal site à la Gilt, targeting design aficionados. Launched less than two weeks ago, it truly is fab. Beautifully executed--naturally--it features a great mix of small items and serious investment pieces by household name and emerging designers, as well as small, regional artisans. Upcoming sales include mod furniture from Objeti, hand crafted New Moon rugs from Nepal and super-glam chandeliers from Avenue Lighting. The other reason that the company is fab is that CEO and founder, Jason Goldberg, is an active practitioner of transparent management, and his blog posts, both pre- and post-launch, are a terrific companion guide to the site. They provide insight into the behind the scenes ins and outs of launching a start-up from a CEO who is clearly interested not only in building a great product but also a great company--and, so far, is hitting the ball out of the park. I've added Jason's blog, betashop, to my must-read list, thanks to his candid and smart first-hand perspectives on start-up and leadership basics, including choosing investors, managing board members, pivoting and staying effective. Fab.com is invitation-only, but request an invite and you'll get one right away. And the company is hiring. While I'm on management, two reads on the subject--Mavericks at Work by Fast Company veterans Bill Taylor and Polly LaBarre and, from another Fast Company veteran, It's Always Personal by Anne Kreamer. Mavericks at Work hit the New York Times' bestseller list when it was published back in 2005, but I only got around to reading it earlier this month. If you haven't read it yet either, and you're interested in creating, leading or growing a disruptive, innovative, open-sourced, values-based, customer- and employee-centric organization, plow your way past all of those buzz words and dig into this book. Case studies from companies large and small will prove energizing and inspiring and will likely kick off some great creative ideas. And I just added the recently published It's Always Personal to my To Read list. I happily cop to having had more than one crying jag at work when I was an investment banker. Thankfully, I always managed to take it outside. But I also always felt that a truly healthy workplace would have been able to handle my tears. Researched in conjunction with ad agency JWT, It's Always Personal explores the idea that workplaces that can handle peoples' tears--and emotions--make for happier and more productive environments. Sounds like it may be a great complement to one of my other favorite reads, Fierce Conversations. This past week, two cases of IPO overreach--Prada and Pandora. Back in February I wrote that had I been advising Prada on its IPO, I would have counseled an offering on the Paris Bourse rather than the Hong Kong exchange. This week Prada priced its downsized Hong Kong deal at the bottom of its indicative price range. At the same time, Pandora's aggressively upsized IPO fell quickly back to earth just two days after it started trading. Neither deal was a disaster--especially in light of prevailing market conditions. It will take time for the stocks to settle in and find their trading ranges. Nonetheless, their starting points were unarguably mediocre and underscore my conviction that patience and perspicacity are underrated corporate virtues, when it comes to initial public offerings; that the much-debated pricing of LinkedIn's IPO was just fine; and that there is no bubble in public technology markets--investors are simply hungry for real growth stories. In addition, the two deals further underscore my conviction that underwriters' fees should be based not only on deal size, but also performance. And finally, now through June 30th the Human Rights Watch Film Festival is running here in New York in conjunction with the Film Society of Lincoln Center. This year, four sweeping themes: Truth, Justice and Accountability; Times of Conflict and Responses to Terrorism; Human Dignity; Migrants' and Women's Rights. The festival features a mix of narrative and documentary films from 12 countries, with 3-4 screenings a day and filmmakers doing Q&A's after each one. An interview with festival director John Biaggi is here.